Upset with Nike's decision to use American football quarterback Colin Kaepernick as the face of its latest advertising campaign, groups of people have started burning the brand's sneakers and sportswear. Nike used Kaepernick to promote the 30th anniversary of its "Just Do It" advertising campaign. The American footballer has not played in the National Football League (NFL) since the 2016 season. 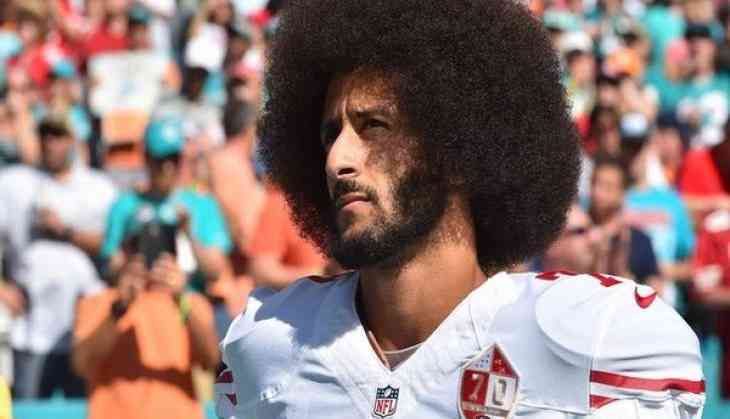 In the same year, he began kneeling during the National Anthem to raise awareness about police brutality against African-Americans and other racial injustices. Dozens of other players joined Kaepernick, making him a symbol of the dividing lines over race in America, CNN reported. In the backdrop of this incident, Nike's decision has drawn strong criticism from customers, who took to social media to post videos of them burning and cutting up their Nike attire. "Nike, due to your support of C.K. in your coming ads, I as an American can no longer support your company. #boycottNike #IStandForOurFlag," a Twitter user wrote while sharing a video of himself setting his Nike shoes on fire. "Nike how you going to endorse Kaepernick a person that advertises socks with cops portrayed as pigs? A person that hasn't played NFL for 2 years. Well it's good I never really spent money on your brand but to the money I did, here they are," another user tweeted. United States President Donald Trump has also responded to the Nike ad campaign, saying the company is sending a "terrible message" by featuring Kaepernick. "I think it's a terrible message. Nike is a tenant of mine. They pay a lot of rent," Trump told The Daily Caller. However, amidst the raging controversy, the NFL issued a statement, attributing to Jocelyn Moore, the league's new vice president of communications and public affairs. The statement read, "The National Football League believes in dialogue, understanding and unity. We embrace the role and responsibility of everyone involved with this game to promote meaningful, positive change in our communities. The social issues that Colin and other professional athletes have raised deserve our attention and action." This is not the first time when people have protested against brands by destroying the goods they had previously purchased. In April, members of the National Rifle Association took aim at YETI coolers after the company cancelled its relationship with the gun-rights lobby.